A almost thirty years long career, during which Hypnoskull – Patrick Stevens‘ project – has always been aiming at stimulating people to question everything and to fight the status quo. A long career full of powerful releases on different media, ranging from tapes by Escape 3 Organisation, to the well-acclaimed full length albums released by Stefan Alt‘s Ant-Zen during the last twentysix years – not considering its several side projects, such as Sonar (with Dirk Ivens). His new album entitled The Manichaean Consciousness, the third release in three years, portraits an inspired artist, in the same way he was during his early days, pervaded by a strong creative urge. This has been expressed at its best during his live performances, as it happened during the last Maschinenfest edition – a moment considered by many as the highlight of the festival. That live performance, together with this album, once again proved the depth of the message of his music and the strength of his ideas. Not only music but, above all, provocation. The energy of that unique liveset was also the result of using practices dear to the pioneers of industrial music. Although the album can’t offer to the listener the same performative experience, and the same energy, he can feel the roughness, the harshness and the power provided by Hypnoskull beat-driven distorted mix of techno and noise, that some would call distorted beat or rhythmic noise. Hypnoskull asks from the listener something more than the passive listening of his music. He wants the listener to understand his inner message, although it isn’t always possible. His musical output isn’t the only example of how this distorted beat-driven music is conceived, made not only to make people dance, but also to make them think about important topics. Since the beginning of the project, Hypnoskull has always criticized media, society and the status quo. 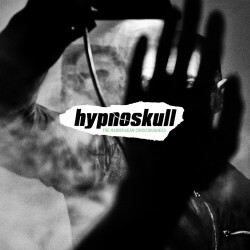 Hypnoskull’s music is electronic music as a weapon to make a war. In Immer Wieder Nein (which translation means “Always say no”), these messages were delivered through Bertold Brecht‘s words, while in Die.4 Generation the narration of the story of Rote Armée Fraktion, through four imaginary stories happened during the so-called “Three Generations” of the terroristic group, was a way to incite people to think for themselves, to fight against ideologies. In The Manichaean Consciousness, the phantom of Italian director, sociologist and philosopher Pier Paolo Pasolini is evoked. Pasolini has been one of the most important and influential intellectuals of the past century. A free thinker, who always criticized bourgeoisie, close to youngsters, to whom he speaks in his posthumous essay entitled Apology, which “bad verses” have strongly influenced Patrick Stevens in his last album. In that essay, through what Pasolini calls bad verses, he invites youngsters to have their own opinions, in a period in which, after the cultural revolution happened in 1968, consumism and capitalism were deeply transforming society, shaping a new middle class of which also the youngsters were part of. This phenomenon, which had been happening because capitalism had already redefined a society where youngsters didn’t have the chance to form a revolutionary thought, concerned Pasolini. The consequence of this social change had also the result of progressively bringing to dissolution the social role of the intellectual. Patricks Stevens, strongly fascinated by Pier Paolo Pasolini’s ideas, starts where the message of Pasolini ends. The principle of free thinking is shared by these two different artists which have more than something in common. Hypnoskull is a sort of intellectual of his music too, as proved by the concept of Anti/Techno Stevens has recently developed. Anti/Techno is a provocation against the music wrongly defined as “techno industrial”, lacking a revolutionary message. Pasolini’ message is here expressed through Hypnoskull banging music. The result is one of his most inspired albums, close to masterpieces such as Electronic Music Means War To Us. An overwhelming, hard and powerful album, in which any sort of melodies and pauses aren’t allowed. The Manichaean Consciousness is a new milestone in Hypsnokull’s music, and it can be considered the result of a process which started with Electronic Music Means War To Us 2. Once again, Patrick Stevens proves to his audience he is still an underground figure. A pessimistic halo, absent in Die.4 Generation, can be found here. The so called Fourth Generation is living in a world in which extreme right wing political groups are experiencing an ever-growing success, and Hypnoskull urges people to save them from themselves. First of all, The Manicheaen Consciousness is, obviously, a musical the quintessence of Hypnoskull sound, that goes back to the origins of the project: distorted techno beats injected with noise, resulting in strong danceable songs, but also in more syncopated stracks, such as A force of reason, as well as Die Zufunkt (Findet Nicht Mehr Statt), which in English means that the future won’t happen anymore, which breaks the techno 4 / 4 beat and exploded in a rough and annihilating power electronics blast. The Manichaean Consciousness starts in the same way it ends, with syncopated rhythms and a funereal atmosphere. At the end of the album, we can’t say if the conscience of the listener has been awakened. What’s sure is that Hypnoskull reaffirms himself once again as a pioneer of his sound, and that The Manicheaen Consciousness is an album you should give a listen to.